Here're a good news and bad news for you. The good news is that if you lose the keys for your TSA-compliant "Travel Sentry" luggage locks then you can just 3D print your very own TSA master keys. The bad news is that anyone can now 3D print their own master keys to open your bags. Yes, the security of 300 Million TSA-approved Travel Sentry luggage locks has been compromised, and now anyone with a 3D printer can unlock every single TSA-approved padlocks. Thanks to a security blunder by the American government agency. 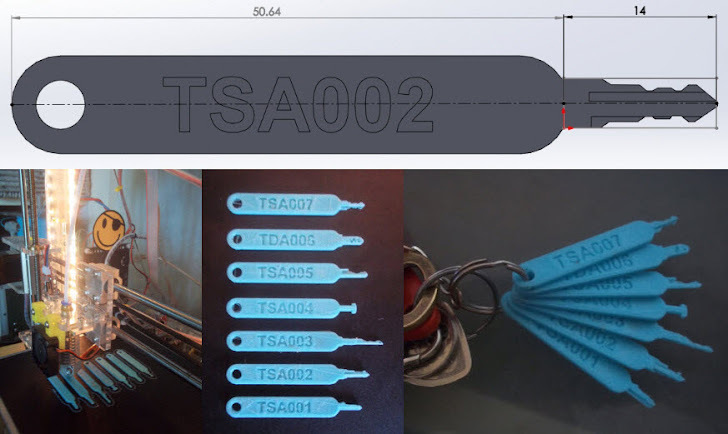 A security researcher with online moniker "Xyl2k" published the 3D printing files for a range of master keys with blueprints to GitHub, allowing anyone to 3D print his or her own copies of TSA-approved locks—the ones the authorities can unlock with their keys during airport inspections. How did the Researcher get the Print? A story about the "Secret Life" of Baggage in the hands of the US Transportation Security Administration (TSA), published by the Washington Post last year, accidentally revealed a high-resolution picture of the TSA's set of master luggage keys. The photographs were taken down by the Washington Post in August, but it was too late. As a security researcher, who already noticed those high-resolution pictures, used those photos to derive exact cuts of the master keys. Though the researcher warned users on GitHub that he had not the released set of keys, Montreal-based Unix administrator Bernard Bolduc demonstrated the successful working of the printable set of keys released by Xyl2k. Within hours, Bolduc downloaded the files, printed one of the master keys in just five minutes on his PrintrBot Simple Metal printer using PLA plastic, and successfully opened one of his TSA-approved luggage locks. The user also published a video on Twitter, proving successful attempt at opening Travel Sentry locks. Also, another lockpicker, Deviant Ollam, posted some photographs on Twitter showing that he also successfully opened his TSA-approved luggage lock with the help of the released set of keys. The impact due to the availability of master keys can not be predicted yet, but the access to all 300 Million TSA-approved locks into the public realm could result in a serious security issue for those who believe their valuables are protected in the locked bags.